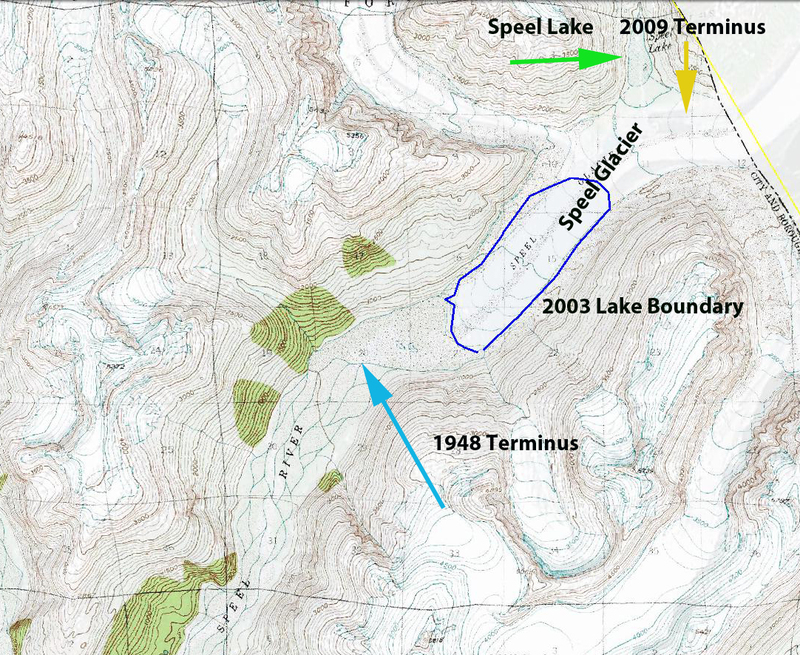 Speel Glacier a 3.2 km retreat from 1984-2013, lake expansion and tributary separation. In 1984 I had a good chance to observe Speel Glacier while flying into Juneau, AK to work with the Juneau Icefield Research Program on the Juneau Icefield. 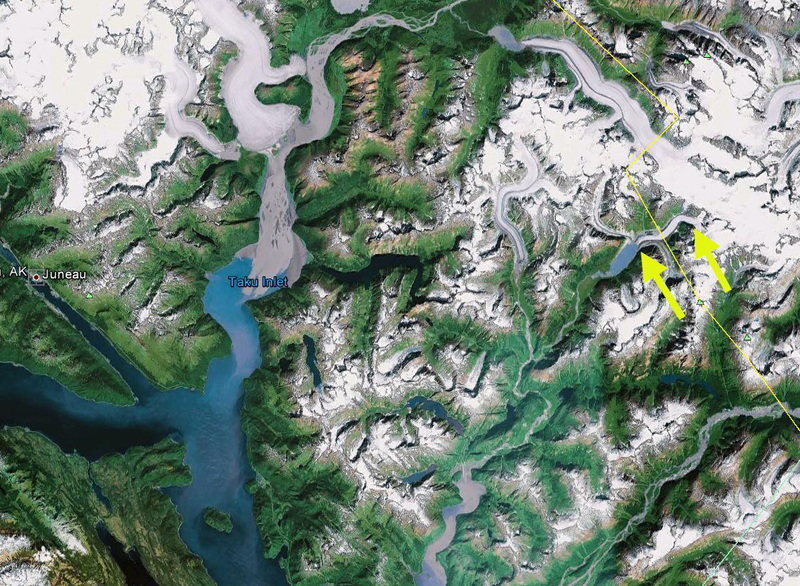 Speel Glacier is south of the Taku Inelt east of Juneau, Alaska. Unlike the map on my lap, there was now a big lake at the terminus of the glacier. This post examines the retreat of this remote glacier and the expansion of the unnamed lake at its terminus. 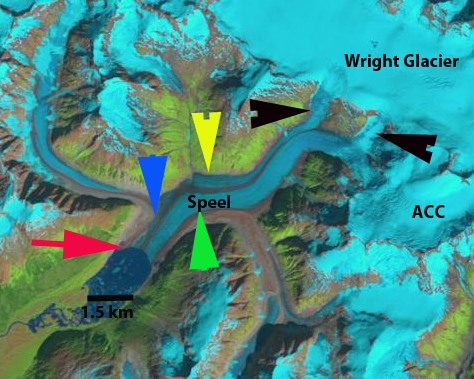 In 1948 Speel Glacier ended at the head of a braided outwash plain, generated by the Speel River. Upglacier in 1948 there was a lake impounded by the glacier, Speel Lake. Today Speel Lake is gone and a much larger proglacial lake exists. The lower part of the glacier was heavily debris covered and stagnant in 1948. By 1968 the glacier had retreated 1 km just to the edge of the current lake. In 1984 the lake was 2.2 km long. In the images below Landsat 1984, Google Earth 2003, Landsat 2006, Landsat 2009 and 2013, the primary accumulation zone is marked ACC, secondary accumulation areas are indicated by black arrows, the 1984 terminus pink arrow, 2003 terminus blue arrow, 2006 terminus green arrow, 2009 terminus yellow. 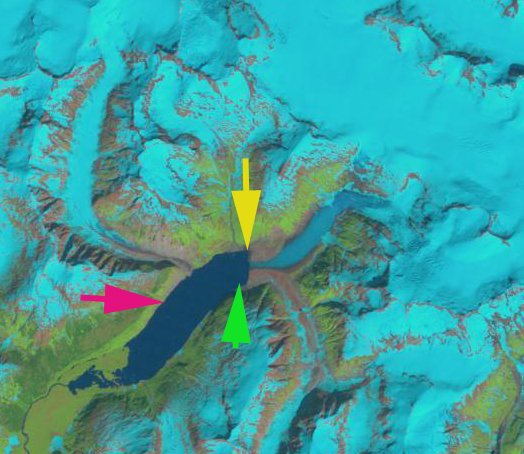 In the 1984 Landsat image the glacier had retreated 2 kilometers from the 1968 position and was fed by a shared accumulation zone with the Wright Glacier-black arrows in addition to the main accumulation area of the glacier above the main icefall on the east side of the glacier. By 2003 the glacier had retreated 1.9 km to where the lake bends east, and the main tributary from the north separated from the glacier. 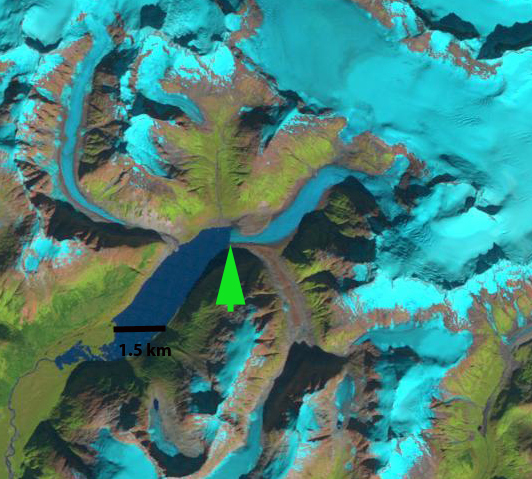 In the 2006 imagery the glacier has retreated an additional 1.8 km. The connections with the Wright Glacier accumulation area had been lost. The tributary from the north that has its own accumulation zone was now completely separated. The glacier was then solely dependent on a single accumulation zone, ACC. In 2009 the glacier had retreated 200 meters from 2006. By 2013 the glacier had retreated from the lake entirely a 6 km retreat since 1948. This should lead to a reduced rate of retreat. The rapid retreat of this glacier has reduced its area at low elevation considerably. This is improving the glaciers accumulation area ratio, to be in equilibrium the glacier needs at least 60% of its area to be in the accumulation zone, in this region Pelto (1987) noted that no glaciers in the region were advancing that did not have an accumulation area ration above 67. In 1984 the accumulation area ratio was 48. In 2006 the AAR is 54, ablation area is being lost faster than accumulation area. The icefall marks the boundary between the ablation zone and the accumulation zone.The retreat of this glacier fits the pattern of other glaciers in the region Eagle, Field, Gilkey, and Chickamin. Today the lake averages nearly 1.5 km in width and is over 5 km long. 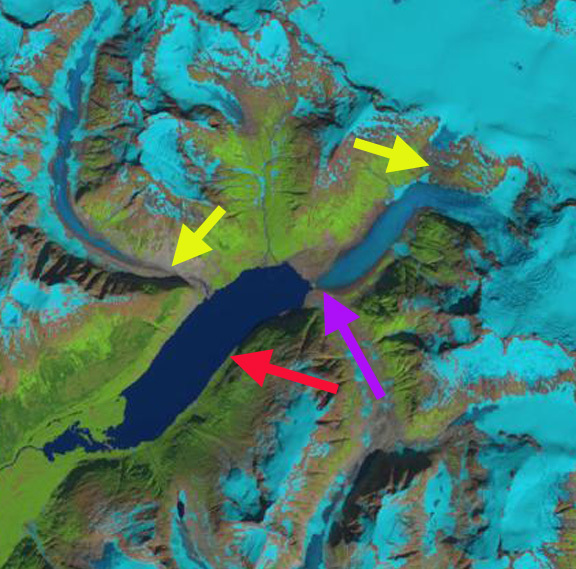 2013 Landsat image- Red arrow is 1984 terminus, purple the 2013 terminus and yellow arrows detached former tributaries. 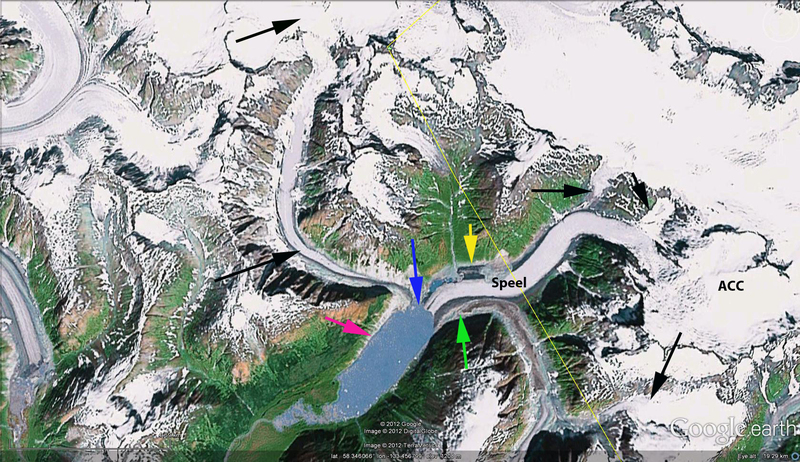 This entry was posted in Glacier Observations and tagged alaska glacier melt, speel glacier, speel glacier retreat, speel lake. Bookmark the permalink.